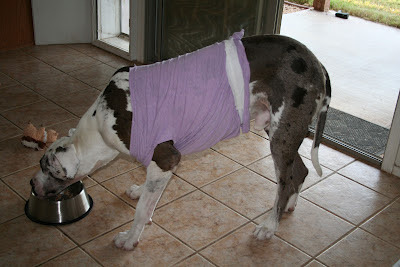 It wasn't until I fell in love with a Great Dane that I learned the leading cause of death in Danes is GVD, or bloat. Because they are a big-chested breed, a Dane's stomach can flip after eating. It happens if they are active, but what 16-month-old dog isn't active? I worried I would come home from work to find him ailing, or dead. So I had him "pexied". That's a surgery where one side of the stomach is tacked to the body wall. Thereafter the stomach can't roll over. Of course, right now he's miserable. Though it was done laparoscopicly, there is still a 2 inch incision in his stomach wall. I feel guilty at causing him pain. But they say Danes only live 8 years. If that includes the 25% that died of bloat, maybe a pexied Dane can live as long as other dogs? I hope so. The vet recommended a t-shirt to keep him from chewing on the stitches. I intended to buy some white sleeveless shirts today, but he started licking last night at 2:30. So he ended up in an over-sized purple t-shirt from my closet. It was surprisingly easy to get him into the shirt. Of course, he was stoned out of his mind when I did it. We'll see how easy it is to dress him when he isn't high on pain medication. Can't I be pretty and serious?